Okay Ladies. . . I'm going a little bit crazy reducing and resizing the Great Granny Blocks. It's been so much fun and I just had to show you another little project I've been working on today. I've included the cutting list to make this Mini Great Granny Block but you're on your own when it comes to making the needle book. Tutorials can sometimes take longer to make than you think and right now I just don't have a lot of time. I have out of town family here for 10 days and then after that I have more company coming for another 5 days and then I go back to School on the 21st of August. If you need help though, let me know. I can answer just about any question you might have. 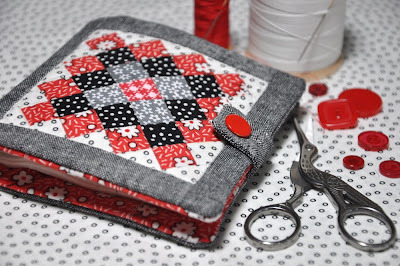 On the funny side of things. . .when I showed the itty bitty block to my husband he called it Molecular Quilting. I got a big laugh out of that and told him that you can't go too much smaller than this without the bits of fabric getting difficult to put through your sewing machine and not burning your fingers when pressing the seams. Talk about itty bitty. . . each little square in the block measures 1/2 an inch by 1/2 an inch. FYI: There are 41 pieces in the Great Granny Block. Finished Block Size: 3 1/8" x 3 1/8" • Finished Needle Book Size: 4" x 4"
can be found @ Bee in My Bonnet. Kaufman's Essex Yarn Dyed Fabric in Black for the Needle Book. I used a red snap for the closure. so you could get a feel for how small the block really is. The finished size of the the needle book is 4" x 4"
I hope you enjoyed seeing the Great Granny Needle Book. It is adorable, I just love the teeny little molecular pieces :) You are on a great granny roll!!! Keep it up, I'm enjoying it! Oh I llove it. It is so cute and awesome. 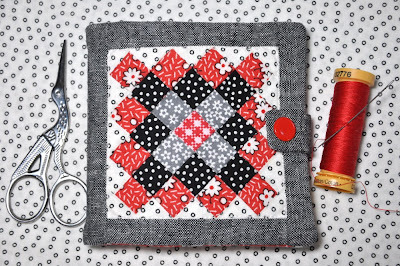 I am sewing on my 12th block of the Great Granny Square and I will surely sew both the pincushion and the needle case. OH MY WORD is that ever cute...teeny! I love your husband's comment! He's sure right...that does border on molecular! LOVE it! It`s super nice.Love and sure make one! !thanks for sharing. Oh my, that's absolutely adorable! ANOTHER CUTE idea!! 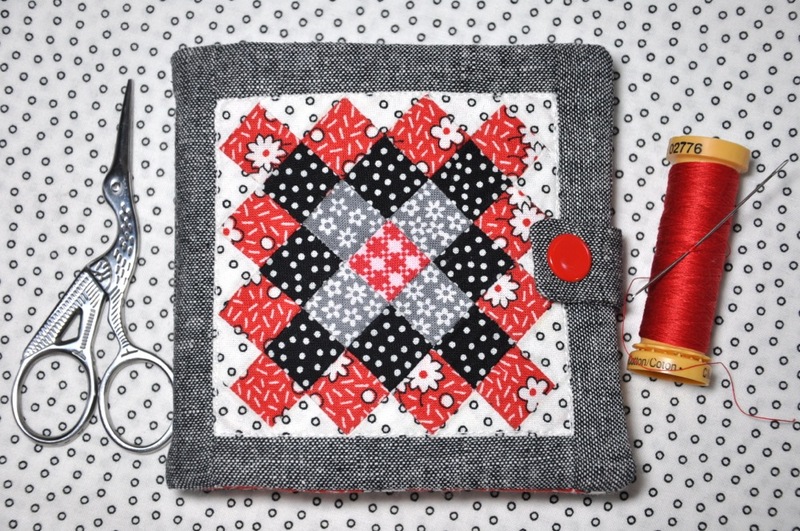 Yep, I do have lots of leftover charm squares too, will have to make this little treat for some gifts! Thanks for the great idea!! Love, love, love it! 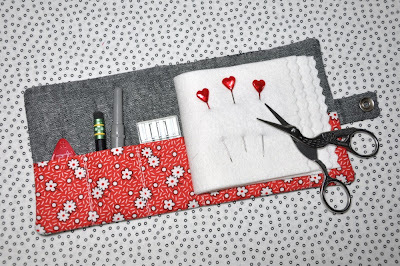 What a great gift for my stitching friends! You are sew clever! I'm not sure I can do those tiny blocks but it will be worth a try. How cute is that!!! That a great idea! But oh, so tiny! Oh my goodness! YOU are amazing! That is too Cute! I love it. You always come up with the cutest things. Oh, Kim...your projects are so cute...I will be making the pin cushion and the needle book! Wonderful - a teeny tiny masterpiece! You must have perfect eyesight!! I love your hubby's comment!!! LOL... and this is ADORABLE!!!! Thank you so much for the math and info - oh my goodness... this is soooo cute! I am so thankful you did the math for these - I was wanting the great granny only smaller! HUGS! 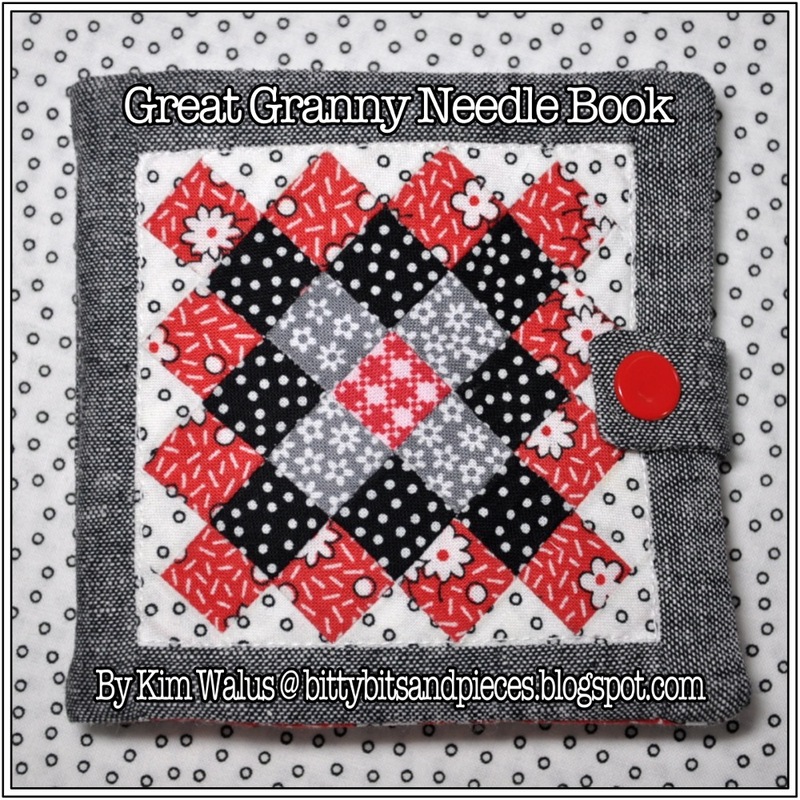 Great little needle book you have there Kim. Love it. This is fantastic. Thank you so much for sharing the tutorial. I want to try this now.